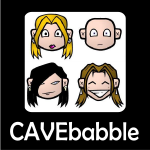 Cavebabble Episode 259 sails with Sinbad to the island of Colossa to find a way to enlarge a tiny princess. Join us for the a look at the classic stop-motion effects of Ray Harryhausen in The 7th Voyage of Sinbad. Also includes Cavebabble Drinks Odd things, featuring peanut butter and jelly beer. This episode is brought to you by The Bosses of Colossa. Cavebabble Episode 257 takes shelter at the library from tidal waves, killer ice storms, and computer-generated wolves. Join us for a look at Roland Emmerich’s 2004 environmental disaster flick, The Day After Tomorrow. This week’s episode is brought to you by Two Days From Now. Cavebabble Episode 256 continues its road trip loop through five states, three state parks, multiple family gravesites, amazing waterfalls, and yet another zoo. Join us! This episode is brought to you by Water Falling Everywhere. Part two of our trip explores amazing natural places such as Niagara Falls, Watkins Glen State Park, and Presque Isle State Park. But it also includes the heartache of childhood tragedy and loss. Some of this is a bit more serious than what we normally share, but is important to us. We hope you agree. Don’t worry. We still chat about pee. The Cavebabblers have eaten enough odd things to fill an entire episode with gastronomical goodness. Whether it’s strange candies and sodas or varieties of vegan jerky, we eat it all so that you don’t have to. Join us! This episode is brought to you by Insert Your Favorite Antacid Here. Cavebabble hits the road again to the Mile High city and beyond in Colorado. Join us! Part One is brought to you by Stuck In A Canyon. Pee Pee Dance Song from Teen Titans Go! Cavebabble Episode 243 creates warriors from folded paper, and joins Kubo on his quest. It’s time for Kubo and the Two Strings, followed by The Little Prince, and Cavebabble Eats Odd Things. This episode is brought to you by The Power Of Origami. The Enterprise is under attack, and Kirk and Spock no longer have time to question their roles in Starfleet. Join us for a look at Star Trek Beyond. This episode is brought to you by New Old School. desperately wanted to cash in on the success of Jaws a year earlier. This episode is brought to you by Wheezy Bear. Nothing says summer more than shiny Egyptian gods of questionable origin. Join us for a look at Gods of Egypt, the box office bomb directed by Alex Proyas. Also included is a new Cavebabble Eats Odds Things, and the triumphant return of email. This episode is brought to you by So Much Gold. Cavebabble returns to the road for the trip home from Montana. Along the way, we view a pit, hit a Wall, and do our best to not start WWIII. Join us! This episode is brought to you by Rattlesnakes Have Been Observed.